New editions of the Harry Potter books are to be illustrated by a Flintshire man after his work won the approval of their author JK Rowling. They will be published in September and will include the work of illustrator Jonny Duddle, from Nannerch near Mold. He is busy reading the Potter books at the moment but has decided not to watch the films about the young wizard. Mr Duddle has previously worked designing characters for Aardman, the creators of Wallace & Gromit. He has also written and illustrated several pirate-based children's books. His new project will see him redesign covers for the successful Harry Potter paperback and hardback editions. "I'm hugely excited to work my way through the wonderful books," said Mr Duddle. "I couldn't have asked for more enjoyable subject matter. "It's exciting, daunting and I feel the weight of responsibility, and I'm just hoping that my illustrations faithfully reflect the characters and world created by JK Rowling." Mr Duddle also spoke to BBC Radio Wales on Monday and said he was reading all seven of the Potter books. "I've done the first one but I'm working through the rest of them at the moment," he explained. "The bits I'm illustrating I read over and over again to make sure I know what's going on in the scene. "The first cover was a test and then it was taken off to show JK Rowling and I was chosen to do the set of covers. "I'm not watching any of the films because I want it to be my interpretation, so I don't want to be too influenced by that." 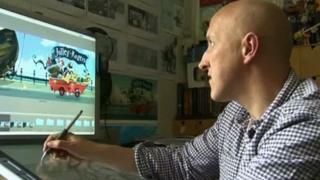 Mr Duddle is best known for his award-winning picture books, including The Pirate Cruncher and The Pirates Next Door. The Radio Wales Arts Show will profile Mr Duddle on Wednesday, 2 April at 1830 BST.